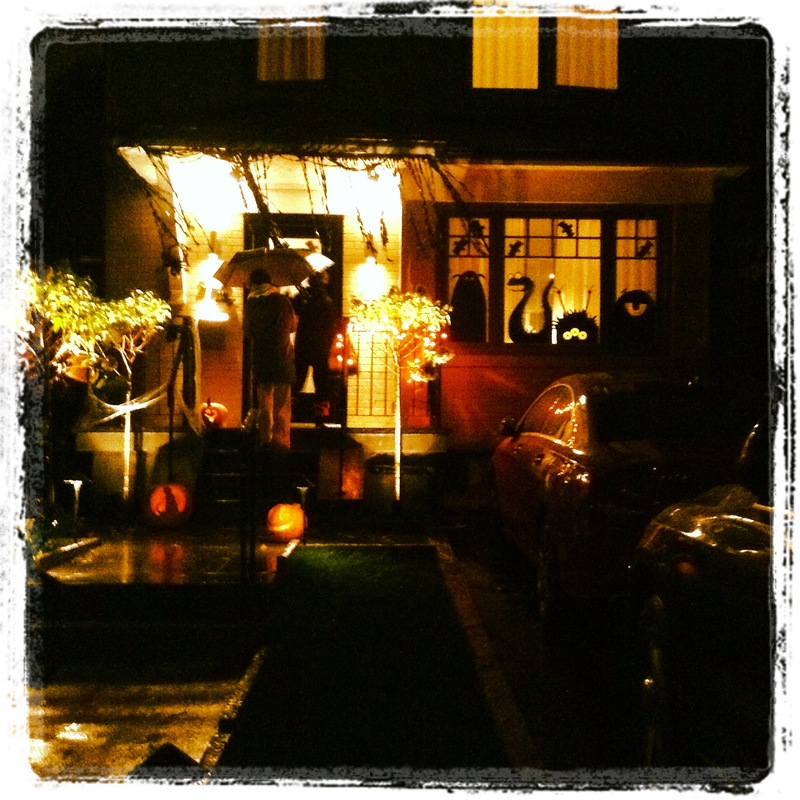 On Friday night, the evening of Halloween, it was still raining (as it had all day). My children, however, still wanted to go out trick-or-treating. Dressing up warmly, we headed out. 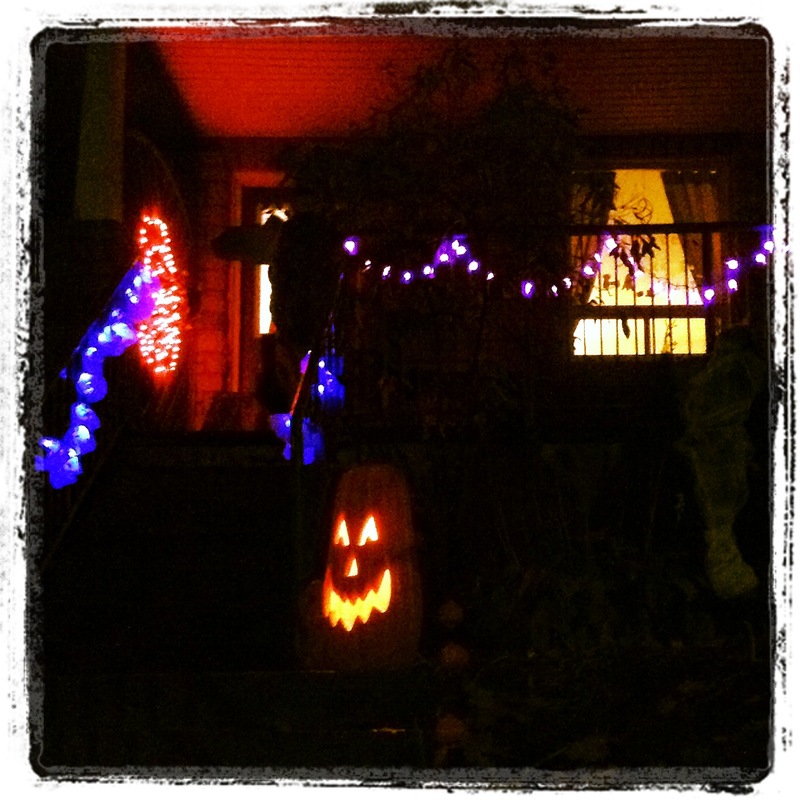 On our evening walk in the neighbourhood, we looked out for entrances that were lit with lights and jack o’lanterns. 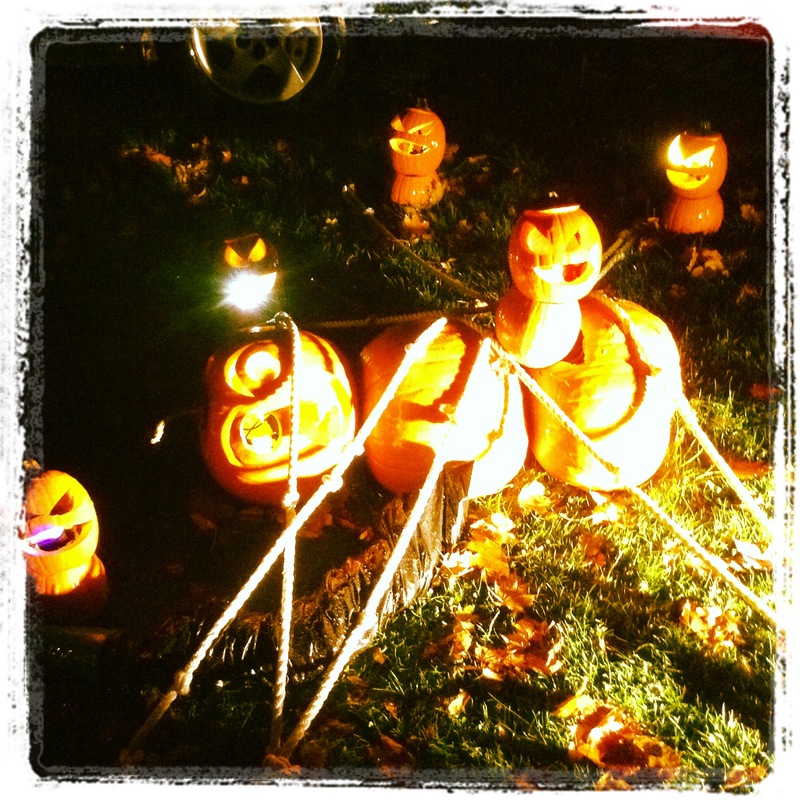 As my children walked up to the many entrances, we admired the decorations that had been set out by the home owners. The one entrance we visited was surrounded by the beauty of Fall leaves. 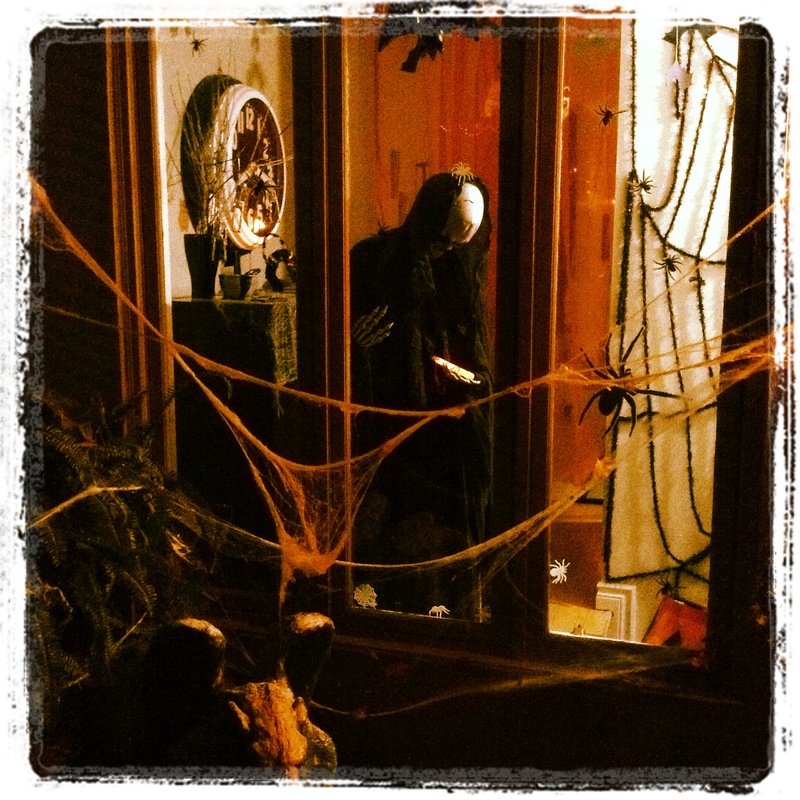 The entrance did not look so spooky to me – instead it seemed to be welcoming. 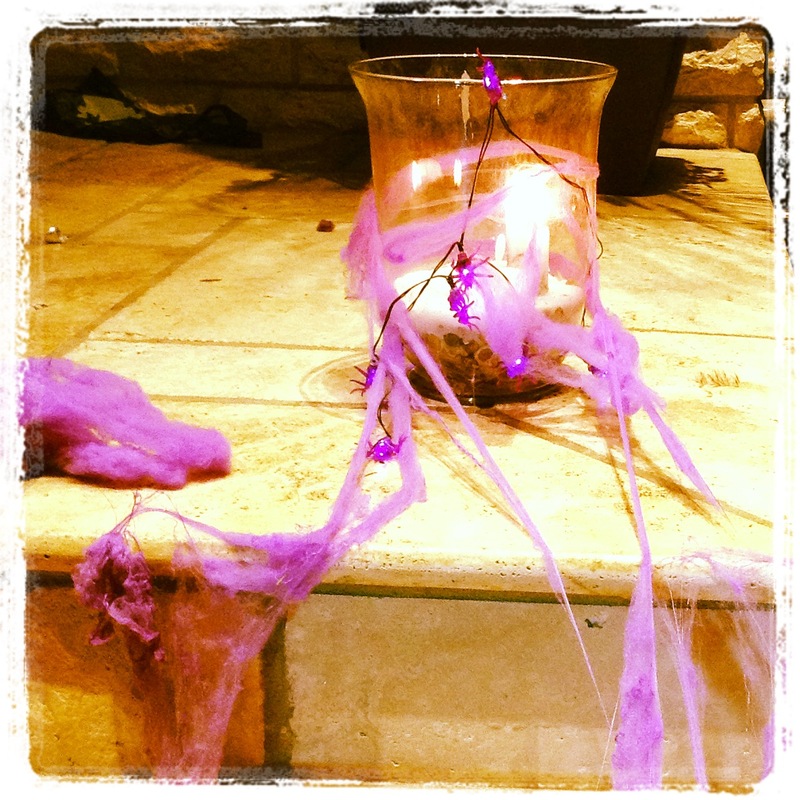 One woman’s Halloween decorations were purple-inspired. As you can guess, I loved it! 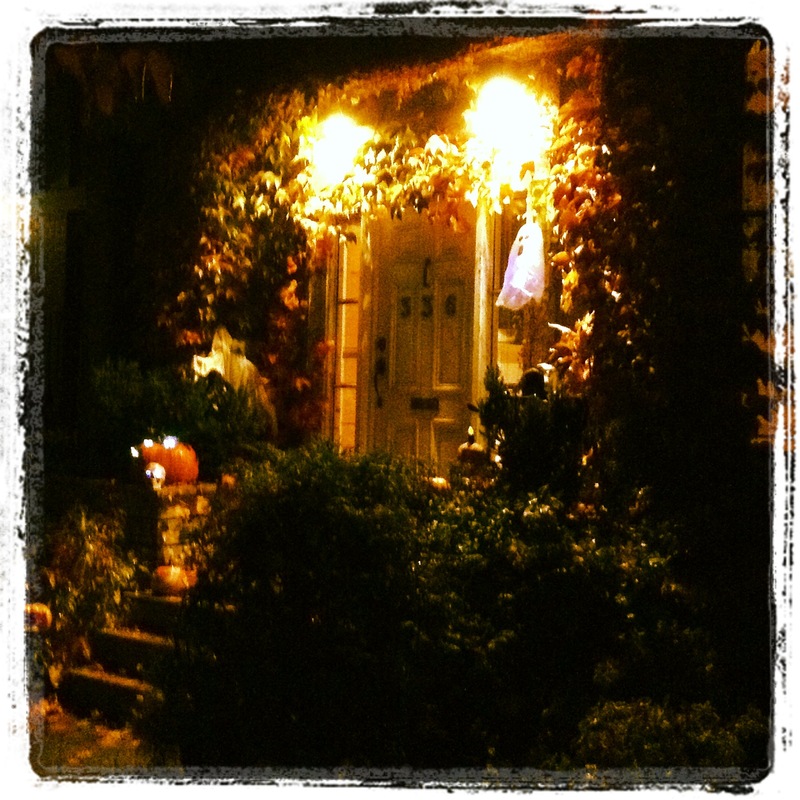 This spooky entrance caught my eye – the decorations were shown through the entrance windows of a house. 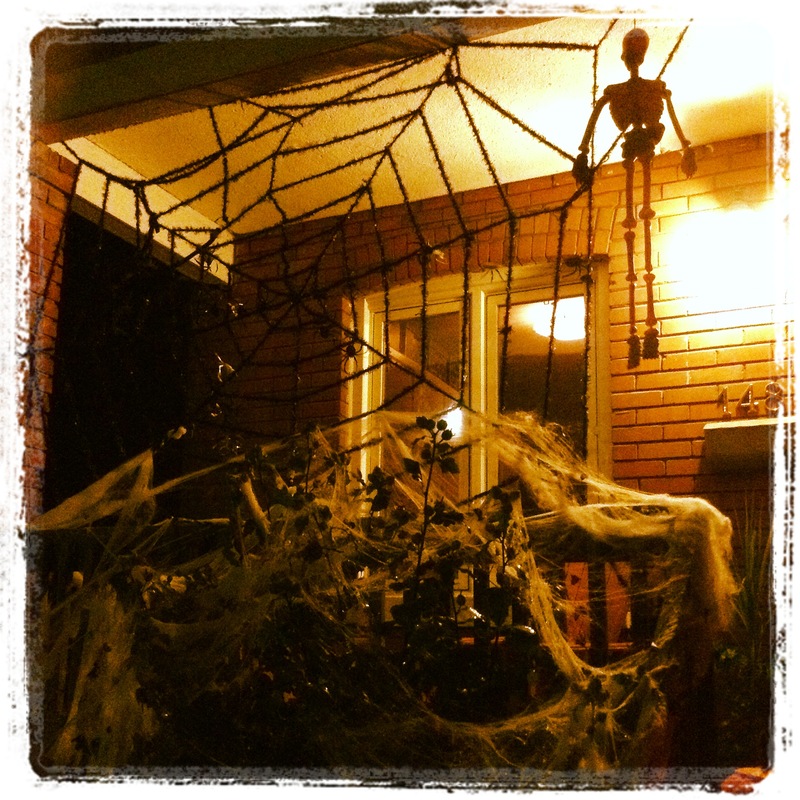 Spiderwebs and cobwebs abounded as did skeletons, spiders and bats. 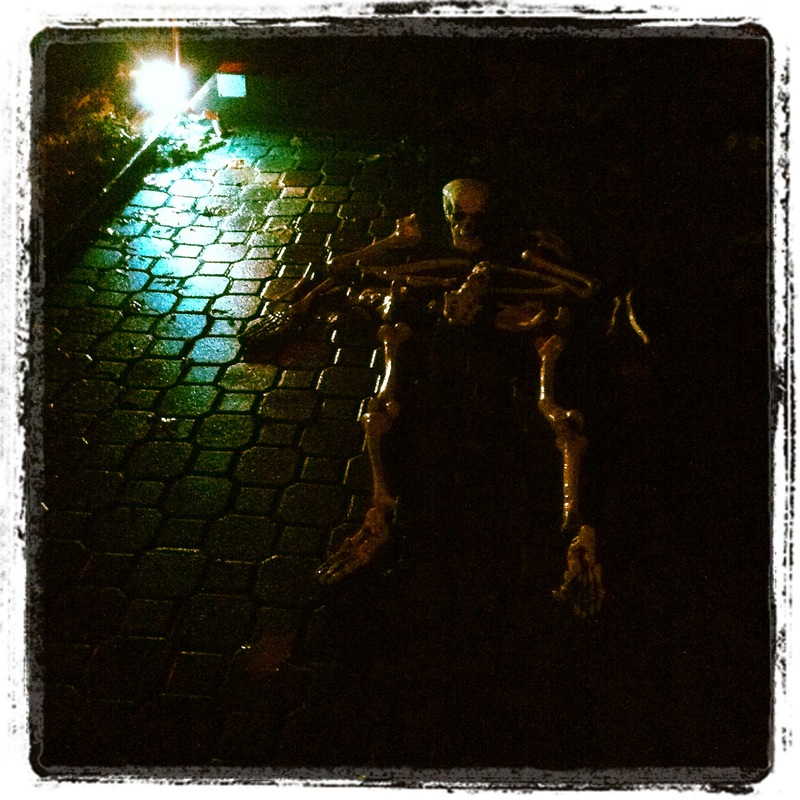 We expected the skeleton lying in the driveway to move – and then realised we had the wrong house. Maybe those homeowners had moved away? 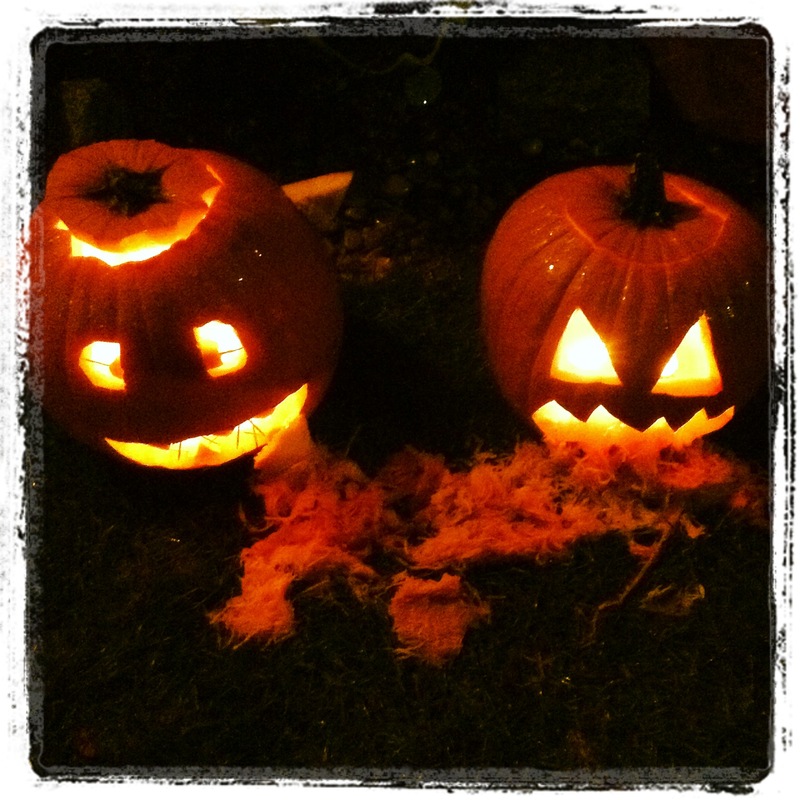 This pumpkin pair had their orange guts spilled out onto the walkway. 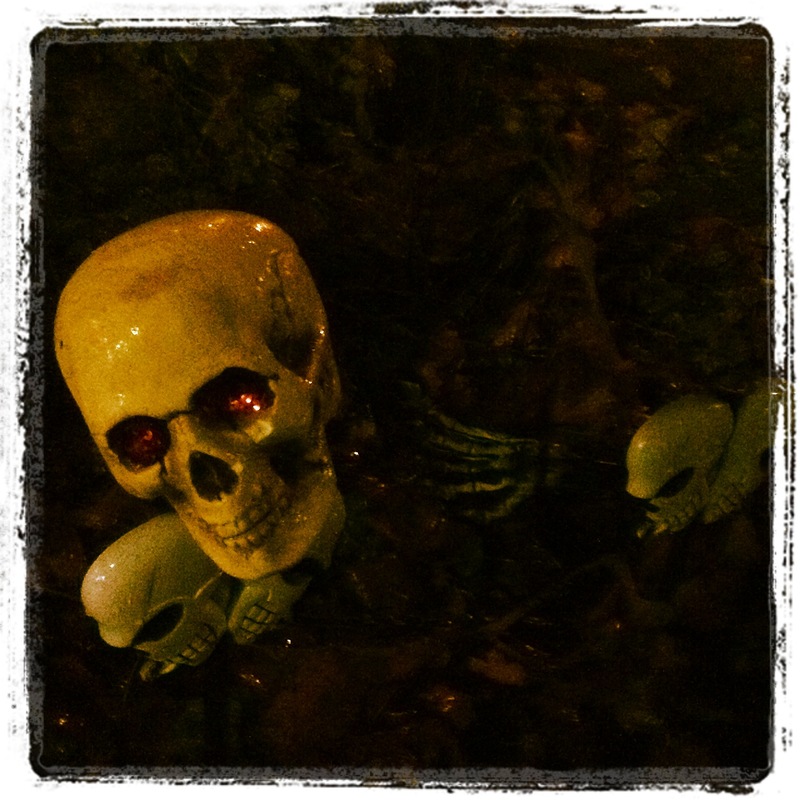 I hope you enjoyed a little of the Halloween sights we enjoyed on our walk. I always enjoy looking at the decorations and the children’s costumes. Sadly the weather this year prevented me from seeing the little goblins and witches in their full regalia. 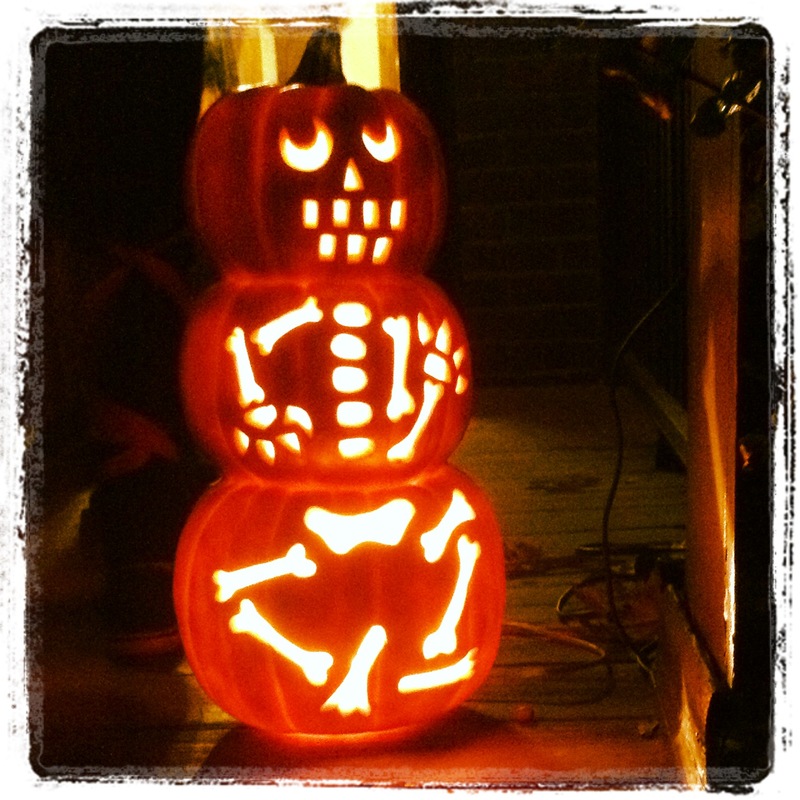 Did you go on a Halloween walk this year? great night – every station had to introduce different theme! That is exactly what it felt like Mihrank. Each house that we approached had decorated differently in their own unique way. It was fun to look at what had been laid out. My girls received quite a bit. I think people are generous to them because my children are polite and comment on the house decorations. 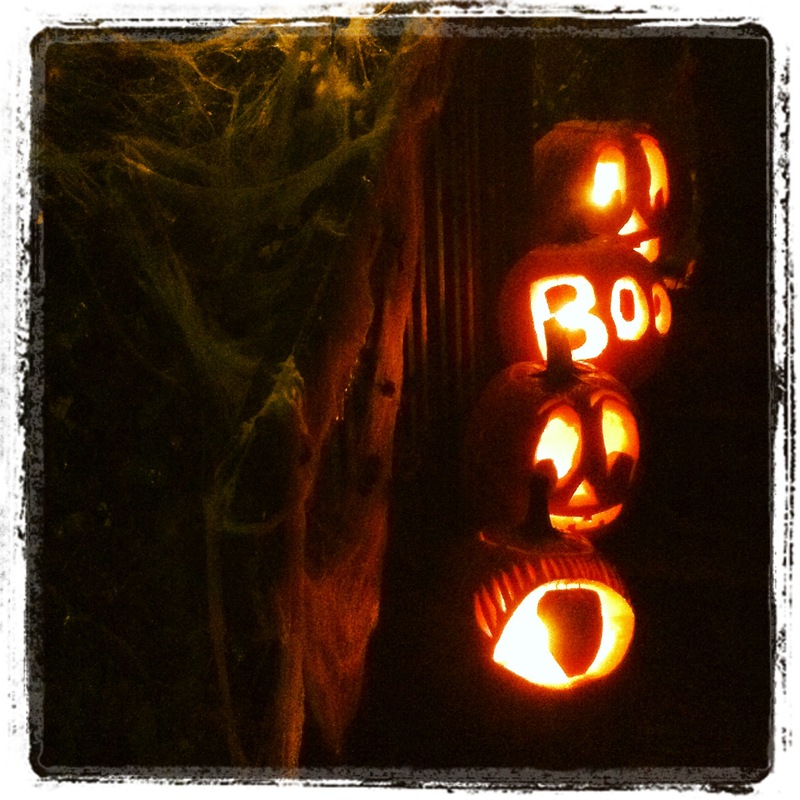 Love this fun Halloween walk! 🙂 Great photos! Thanks for sharing a great walk! Creative neighbors! I miss going out sometimes, my children are grown. People had really made a great effort with their pumpkin carving and decorations. Loved looking at them all. Did you get many treats? Wow, some really cool pumpkins. I really like the three tiered carved one. Cleaver. Some great shots for night work. Thank you for sharing. Your iPad? Wow. I’m just starting to use my tablet for more than cooking. I don’t have a flash, but pics are not to bad if the lighting is good. A lot of time and effort went into those great decorations, and very imaginative too, I liked the spooky scene through the glass doors, well set up. 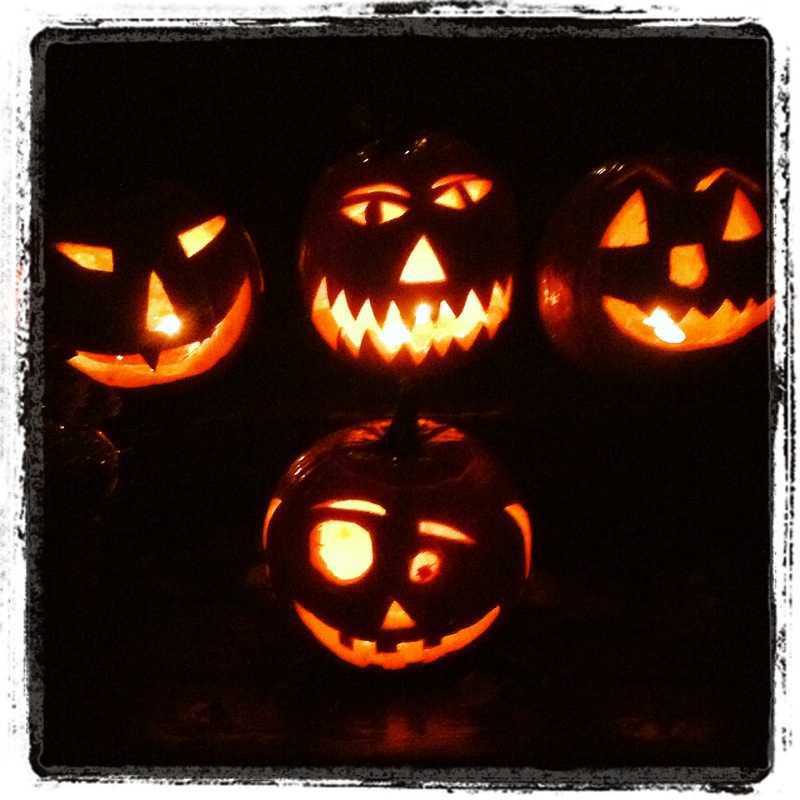 Enjoyed the pics of your Halloween night Colline. I think it is definitely a North American event Ian. After Christmas, Halloween is the celebration that causes a lot of expenditure. Wow, those are some serious Halloween decorations! Aren’t they amazing? I love them. 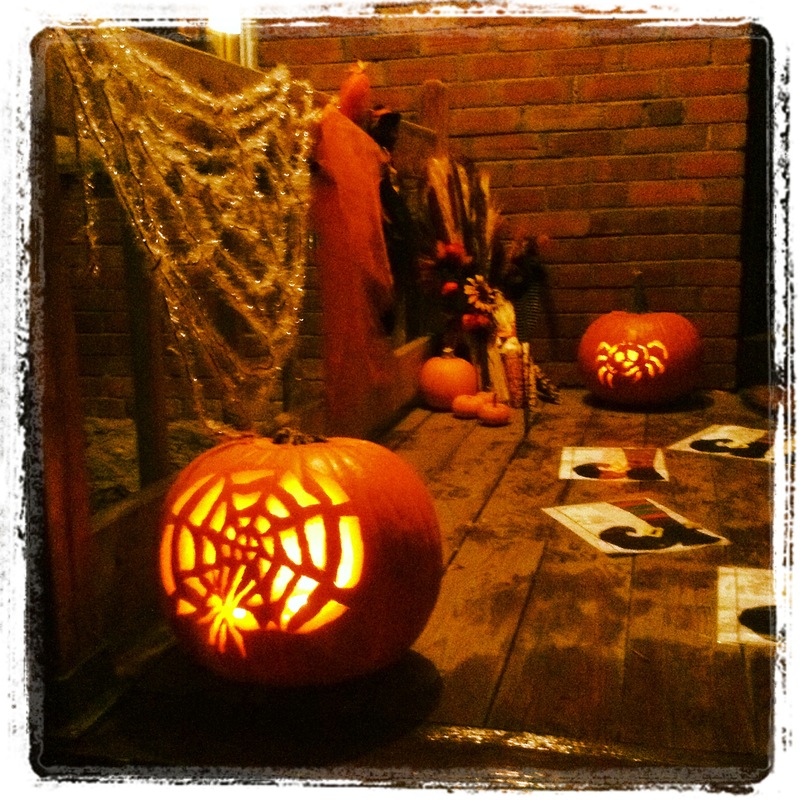 What an imaginative lot of neighbours you have – some great decorations here – great photos too! I went out with my two granddaughters but the rain and snow flakes eventually drove us back home – so nice to see the enjoyment kids get from this night though. 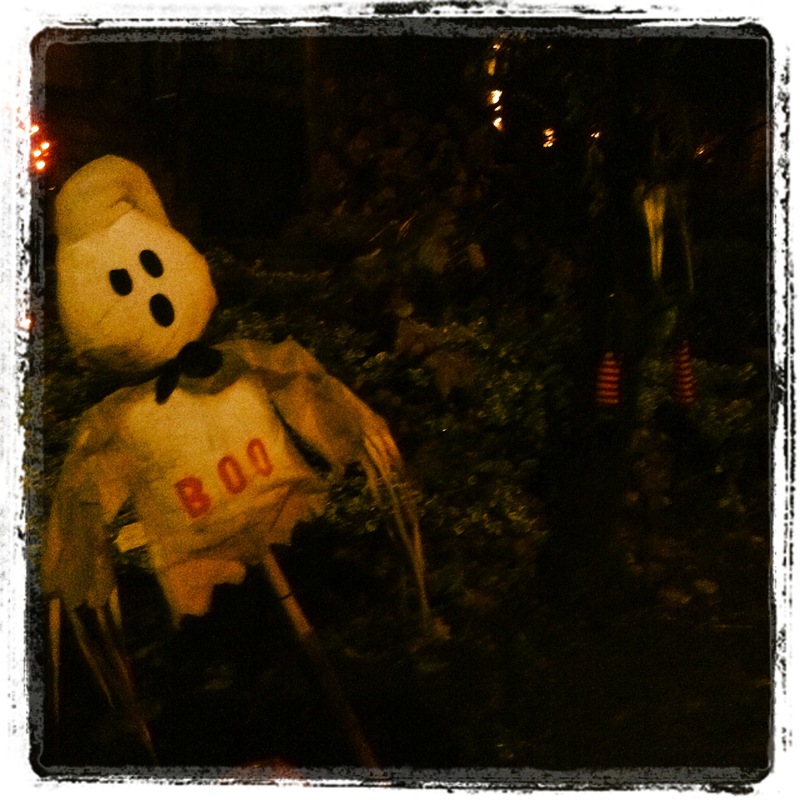 Colline, I enjoyed coming along with you on the Halloween walk! 🙂 Yes, I liked the purple decorations too! Photo ops are always waiting to be seen Colline and you made the most of this one. Glad to see so many got into the spirit! It is a big thing here in our neighbourhood TB. It just makes it more fun for the kids.